It is ONLY a Transmiter. This package does not include a receiver. 9V battery is not included. Has 4-dip switches in battery compartment, Wall mount bracket included. 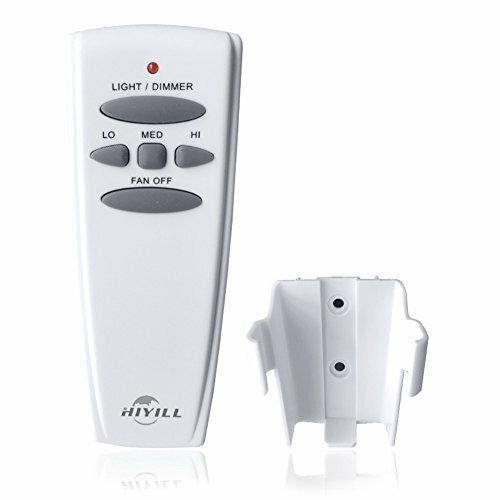 There are 4 buttons (Low/Medium/High/Off) to control your ceiling fan speed and light brightness. The light button will control the light on and off. Dimmer controls light brightness when pressed.The red indicator on the transmitter will light when one of the 5 buttons is pressed. This is the remote control for the ceiling fan. They should match the switches on the transmitter inside the ceiling fan.Use a 9V size battery in transmitter. Replaces for Hampton bay remotes including FAN-HD, UC7078T, HD5, CHQ7078T. Also include Standard-RR7079T. The light button will control the light on and off. Dimmer controls light brightness when pressed.The red indicator on the transmitter will light when one of the 5 buttons is pressed.Replaces for Hampton bay remotes including FAN-HD, UC7078T, HD5, CHQ7078T. Also include Standard-RR7079T. Nice Warranty and After-sales e-mail service:This remote comes with a manufacturers 1-Year Replacement Warranty. For details, please refer to 《HIYILL After Sales Service》in your product box. If you have any questions about this product by HIYILL, contact us by completing and submitting the form below. If you are looking for a specif part number, please include it with your message.